Home of the Blue Demons and located in Landenberg, Pennsylvania, Kennett Middle School is the sole middle school in the Kennett Consolidated School District. The impressive building was built in 2002 and continues to be a hub of academia and activities in the Kennett community. Kennett Middle School was proud to be recognized as a Pennsylvania Don Eichhorn School to Watch in both 2012, 2015, and 2018. Upon entering the Kennett Middle School building, our Kennett PRIDE is evident and can be seen and heard throughout all five wings and in common areas. The safety, well-being, and academic, social, and emotional growth of our adolescent students is the priority of our dedicated staff members. Principals and counselors “loop” with and follow their grade every year. 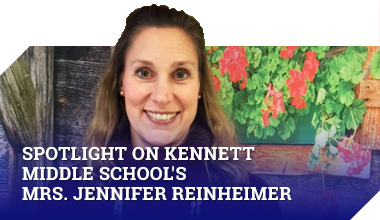 The Kennett Middle School curriculum challenges a student’s intellectual potential, serves as preparation for high school, and provides an opportunity for growth and success for each student. Core curriculum offerings include Mathematics, Language Arts, Science, and Social Studies. Advanced, honors, and support classes are offered to those who qualify. Advanced math course topics include Algebra I and Honors Geometry. World language offerings in Latin I, German I, French I, and Spanish I are available in eighth grade in place of the WIN classes. Every year near Thanksgiving, Kennett Middle School celebrates the spirit of giving and of the holidays with three events that raise at least $3000 each year! The proceeds from the events go to 10-15 families in our community who are in need. Events in years past have included the Sixth Grade Glow Dance, Seventh Grade’s Got Talent, Are You Smarter Than a Seventh Grade Teacher?, the Eighth Grade Faculty vs. Students Volleyball Game, and the Eighth Grade Teacher Turkey Costume Contest. Need something to do after school? After-The-Bell is for you! This community-based program combines the expertise of community members and the interests of middle school students. After-The-Bell is free and transportation home is provided. Fall, winter, and spring sessions meet Tuesday, Wednesday, and Thursday afternoon for six weeks. Sessions begin with a snack at 3:00 P.M., and end at 5:00 P.M. For more information visit www.afterthebell.org or visit the After-The-Bell office located in room C106 at Kennett Middle School. Computer Application courses are designed to build a foundation for students to successfully navigate 21st Century skills for academic, social and professional purpose. Skills and topics include keyboarding, cyber safety, productivity applications, academic and professional formatting, digital collaboration, and communication. Singers will learn singing techniques through music selected from a variety of styles, time periods and languages. Choirs perform in December and June. Concert attendance is a required component of the course. Info with specific dates will be sent home through your student. Student grades are based on daily participation, written assessments, performing assessments and concert attendance. Students sing, dance, and play Orff instruments, drums and recorders. They read musical notation, listen to, and analyze music of various cultures, time periods and styles. Assessment consists of class participation, musical skill competencies, group work, and quick quizzes. One semester is “Intro to Guitar” and one semester is “Intro to Group Percussion.” Grades are based on participation, written assessments, performing assessments. Band and Orchestra are the two instrumental music classes. Instrumental music students sign up for one instrument and focus on the ins and outs that specific instrument. Instrumental music students are required to attend lessons, practice at home, complete quarterly playing assessments, and participate in concerts that are outside of the regular school day. The Orchestra focuses primarily on Violin, Viola, Cello, and Bass. The Band focuses on Flute, Oboe, Clarinet, Bass Clarinet, Bassoon, Alto Saxophone, Tenor Saxophone, Baritone Saxophone, Trumpet, French Horn, Trombone, Euphonium, Tuba, Mallet Percussion, and Battery Percussion. New students are welcome to begin in 6th grade. In 8th Grade selected band students participate in Full Orchestra. Students are permitted to focus on two instruments but they must be approved by one of the instrumental music teachers. Family and Consumer Science Food Lab provides an opportunity for students to learn about healthy eating, nutrition, portion sizes and further exploring foods through a variety of hands on learning activities including food labs. In the Family and Consumer Sciences Sewing Lab, students will have the opportunity to practice and improve skills needed to grow in independence and in their abilities to contribute toward family and social well-being. They will be encouraged to practice effective management skills, and show responsibility while completing both individual and group projects including sewing, consumerism, and time management. Health Education provides the opportunity for students to develop skills necessary to become health advocates. Students learn cognitive and social skills that help promote positive living through the study of nutrition, fitness, personal health, HIV/AIDS intentional/unintentional injuries and drugs. In 6th, 7th and 8th grades, the basic elements and principles of Art and Design are introduced in a way that builds upon skills learned in each previous year. Students work with a variety of materials in both 2D and 3D formats (drawing, painting, ceramics, etc.) and are instructed in proper usage of the tools and materials. Sketchbooks are used each year to build a portfolio of student work as well as for observational drawing labs which allow students to practice observational drawing and to gain an understanding of proportion, visual measurement, drawing the human figure and drawing from real life. STEM at Kennett Middle School is meant to provide our students with a unique approach to better understanding engineering concepts. The content used for these classes are provided by one of the nation’s leading STEM curriculum programs, Project Lead the Way. This curriculum is focused on providing activity-, project-, and problem-based learning. Throughout their three years at KMS, our students will work through a different course each year. Sixth graders will take Design and Modeling, using industry standard 3D modeling software to create a virtual image of their designs, and producing a portfolio to showcase their creative solutions. Seventh graders will take Flight and Space, creating dragsters, hot air balloons, gliders, and rockets, all with basic materials, further enhancing their problem solving skills as well as giving them a look into the science concepts behind aerodynamics and physics. In their final year at the middle school, the eighth grade students will take Automation and Robotics where they will trace the history, development, and influence of automation and robotics. They learn about mechanical systems, energy transfer, machine automation and computer control systems. Students use a robust robotics platform to design, build, and program a solution to solve an existing problem. In the years that KMS has been at the new school, there have been outstanding musicals (from the Broadway Jr. Series.) Annie, The Wizard of Oz, Guys and Dolls, and Charlie and the Chocolate Factory have all been performed on the Middle School stage. These student productions are assisted by enthusiastic and experienced staff directors. Our directors begin with the belief that all students should have the opportunity to participate in the musical. Everyone who tries out for a part is involved in the show in some way. Student participation is tremendous. There are roles for singers, dancers, actors, extras, and those most important folks, the stage, light and sound crew. In 2015, KMS initiated a Positive Behavior Intervention and Support program. Our PBIS Program is called Kennett PRIDE. For more information, please view our Kennett PRIDE website. LEAD is a mentoring program that began in 2013 at Kennett Middle School. LEAD stands for Listen, Encourage, Advise, and Discuss. The two goals of LEAD are to build positive relationships and foster academic success. All students at KMS are assigned to a LEAD teacher. This teacher has regular contact with the student and his or her parents about the student’s academic, social, and emotional progress throughout the year. The LEAD teacher may facilitate conferences with students and parents informally but will meet formally twice a year during Fall and Spring Parent Conferences. LEAD is an advisory period that occurs twice a month during the school day. For more information, please view our LEAD website. Students in sixth, seventh, and eighth grade can join Student Council. Students who are involved in Student Council volunteer as guides for Back to School Night, Fall and Spring Parent Conferences, and Spring Open House. They also sponsor various events such as “We Wear Pink on Wednesdays” in October for the Breast Cancer Foundation, the “Give As Much As You Can” canned food drive in November to benefit the Kennett Food Cupboard, and the school-wide holiday card writing campaign for area nursing homes and senior centers. Student Council meets after school once a month and sometimes during lunches. Computer labs are located in each classroom wing, and in the library classroom. Additionally, laptop carts, iPads, and MacBooks are available to enhance classroom instruction. In addition to the hardware, technology is supported by a high capacity fiber optic Internet connection. For student’s safety the Internet connection is protected by a firewall. Students also have the opportunity to bring their own technology (in the form of tablets, iPads, or laptops) by participating our building BYOT program. New in 2015, our loaner laptop and Kindle program in the Library allows students to rent technology.